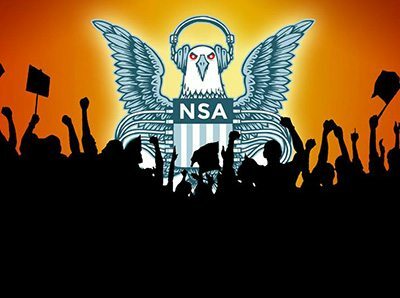 A broad and seemingly unlikely coalition of 19 organizations including church leaders alongside environmental and gun advocacy groups represented by the Electronic Frontier Foundation (EFF) filed a lawsuit against the National Security Agency (NSA) in a San Francisco federal court Tuesday in a case that could determine the constitutionality of an admitted dragnet surveillance program on the telephone records of millions of Americans. The lawsuit, First Unitarian Church of Los Angeles v. NSA seeks an injunction against the NSA, FBI and the Justice Department, alleging that the government violated the plaintiffs’ First and Fourth Amendment rights by collecting information about their phone calls. The lawsuit focuses on an NSA surveillance program called the “Associational Tracking Program,” which collects metadata on telephone calls from the top U.S. telecommunications companies. The program is part of a vast operation of NSA spying programs revealed by NSA whistleblower Edward Snowden. The lawsuit argues that dragnet surveillance tracking associational ties creates a chilling effect whereby individuals are dissuaded from taking part in the activity of advocacy organizations for fear of disclosure. The case follows on the precedent-setting NAACP v. Alabama, in which the Supreme Court ruled in 1958 that membership lists of organizations were protected under the First Amendment. The EFF hopes to apply that right of association in the digital age. “Many potential supporters of our work would find themselves intimidated from raising their voices, knowing that the state is tracking who they talk to,” Buttar said. The First Unitarian Church of Los Angeles has been involved in social justice work for decades, from resisting McCarthyism in the 1950s to fighting California’s “loyalty oaths,” which require all state workers to sign a pledge to defend the state. But the Rev. Rick Hoyt of First Unitarian is not only worried about a chilling effect on the church’s members, but about its effect on the larger community the church serves. Director of National Intelligence James Clapper verified the telephone surveillance program last month after it was subsequently revealed by the publication of a Foreign Intelligence Surveillance Court order. Clapper, a defendant in the lawsuit, said the program has been authorized by the Foreign Intelligence Surveillance Act. Last week a federal court judge threw out the Obama administration’s “state secrets” claim in another class-action lawsuit filed by the EFF and a group of AT&T customers in 2008 targeting the Bush administration’s dragnet surveillance of communications. This latest lawsuit joins a wave of legal challenges aimed at the government’s intelligence-gathering programs, including a similar case filed by the American Civil Liberties Union in June. A major challenge in many of the cases has been the plaintiffs’ ability to prove their standing by showing conclusively that they have been wiretapped by the NSA. According to EFF Legal Director Cindy Cohn, the issues of standing presented in cases such as Clapper v. Amnesty International, which was decided by the Supreme Court last year, may not be relevant now that the DNI has admitted to the broad, indiscriminate collection of telephone records. The lawsuit also challenges the government’s ability to secretly interpret section 215 of the Patriot Act to justify its dragnet surveillance on ordinary Americans, claiming under the Constitution’s due process clause that secret interpretation makes the law unconstitutionally vague. According to Cohn, doctrines within the Patriot Act statute allow a court to consider whether the administration enforcing the law has gone beyond its authority. The EFF hopes to seize upon those doctrines as well as challenge the constitutionality of the statute itself. Copyright, Truthout.org . Reprinted with permission.